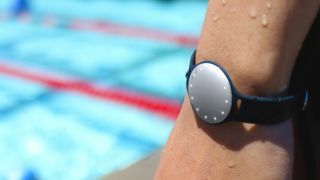 Known for fashionable fitness trackers with long lasting battery lives, Misfit is announcing a new partnership with Speedo to bring you a brand new Shine: the Speedo Shine. Yep, the name is a little silly but it has been honed by the two companies to better track swimming laps and distance with algorithms for different kinds of strokes - plus you can still take it up to a depth of 50 meters. The Speedo Shine is also capable of tracking walking, running, cycling, basketball, tennis, soccer, yoga and even dance. It can automatically track light and deep sleep like the Misfit Shine as well. All the metrics sync up wirelessly via Bluetooth to a free companion app for both iOS and Android devices. Similar to previous Misfit trackers, the battery life is about six months on a Lithium coin cell battery. There's even a new Speedo exclusive light gray color called 'Pure' while two sport bands - white and black - a clasp and an Action Clip will ship in the box with the tracker. The Speedo Shine will initially be available exclusively at Apple stores worldwide on September 1, as well as on misfit.com and SpeedoUSA.com for $79.99 (£59.99, around AU$108).